This is possibly the easiest conversion I've ever done too. The biggest issue was modeling the legs of the pants on the mini and making sure it looked proper. It took me maybe an hour of messing with green stuff to get the thickness and shape right, but I'm really pleased with the results. The hair was also green stuff, but that was easy thanks to a couple tutorials and I just needed to make a convincing mop of unkempt hair. 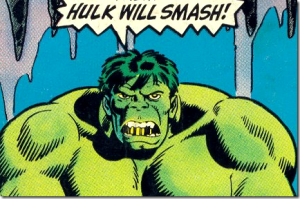 Being that he's the Hulk, and the Hulk smashes, I wanted there to be a bit of destruction around him. 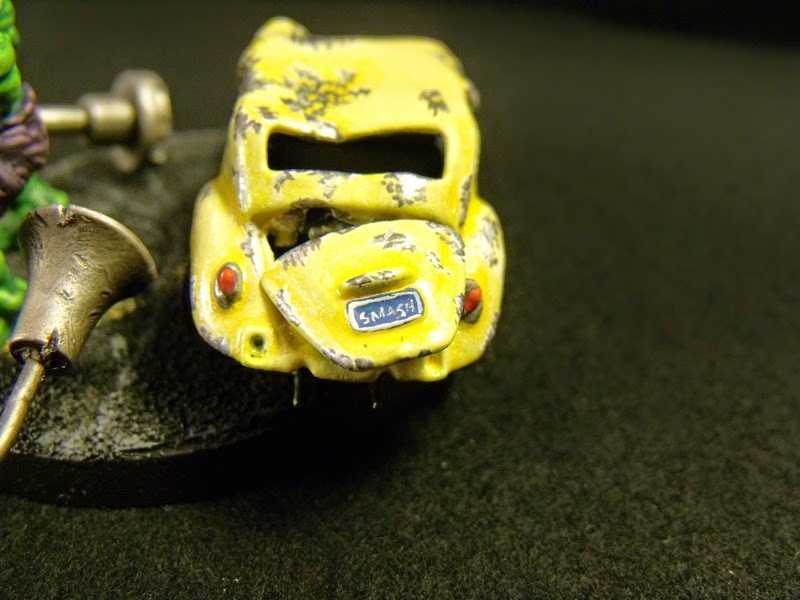 So off to the toy store I went and found a pretty nice die cast VW Beetle. 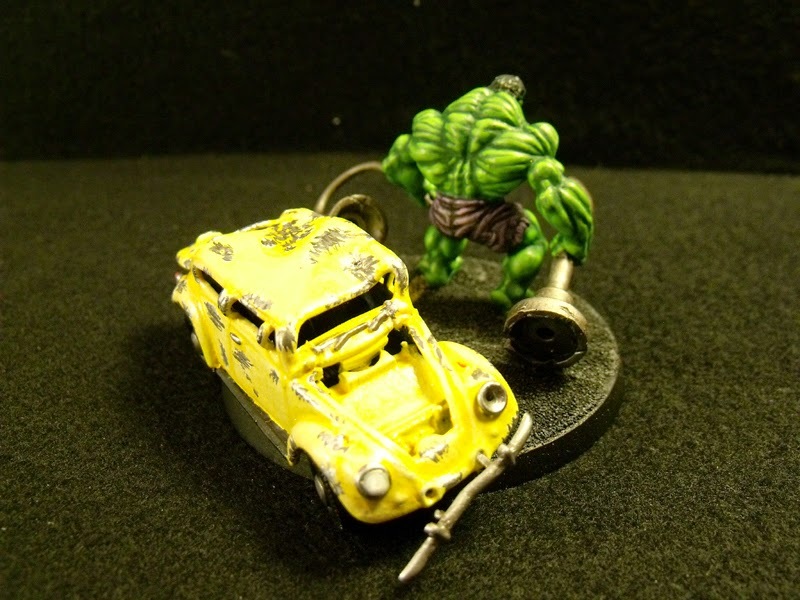 To make it look like Hulk had wrecked it, I tore the hood and trunk lids off. and beat the hell out of it with a hammer and a pair of need nose pliers. of the hole in the ground. But I couldn't find an adequate looking one. 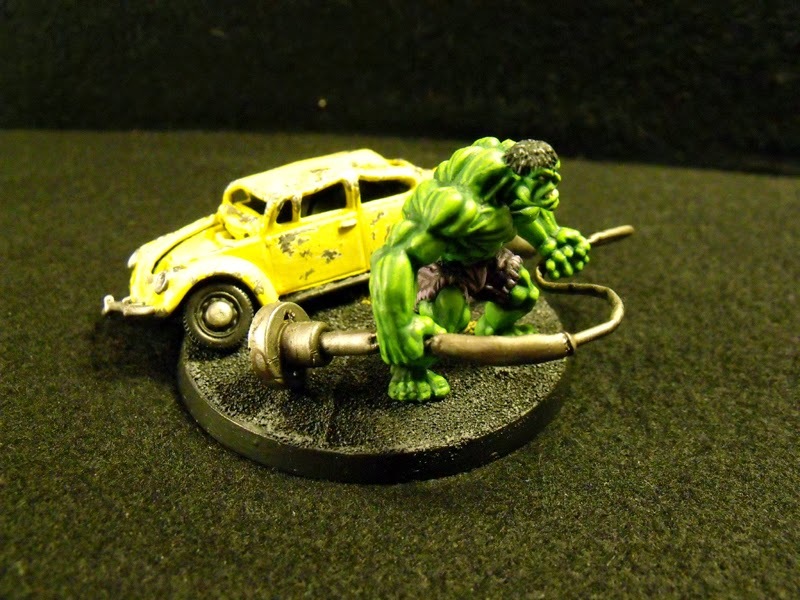 But I did find a HO scale street lamp and knew instantly that it would make a nice add on to have Hulk twisting it in his hands. Bonus! With the Beetle and the lamp in hand, I knew I wanted him to be on a city street. Originally I had a 5" x 5" base made up for him with clay and cork laid out on it for cracked asphalt. This turned out to be less than optimal, so I scrapped it and instead found an old GW round base and went with the old blister pack plastic and sand trick. I do like that trick, and it does a good job of making convincing fake cracks. As for painting. I went with classic Hulk colors and even gave him purple pants. It's kind of hard to tell in the pictures though for some reason. But they look great in person. 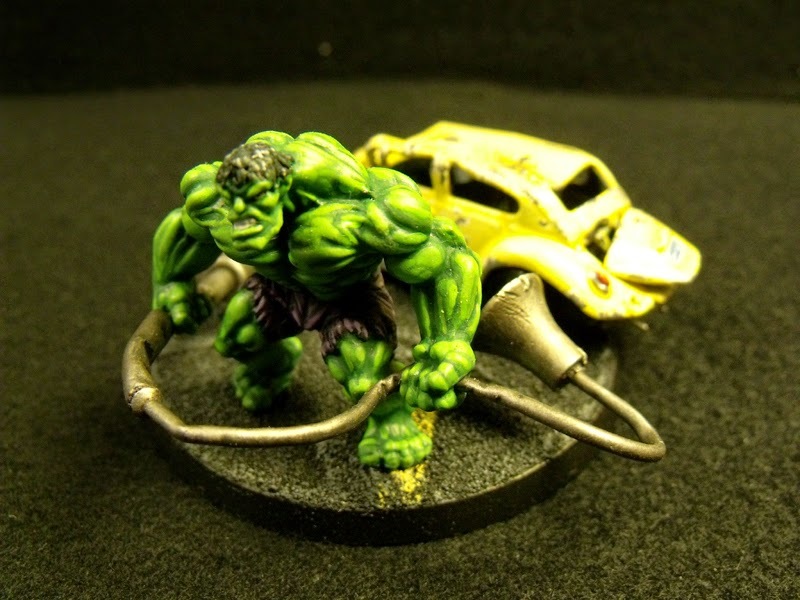 The Hulk's skin was painted starting with a darkish green and working my way up to a more neon green. I'm really happy with the way his skin turned out. Especially the muscles on his back. beating the crap out of it, I undercoated it white and painted the body a dark yellow. 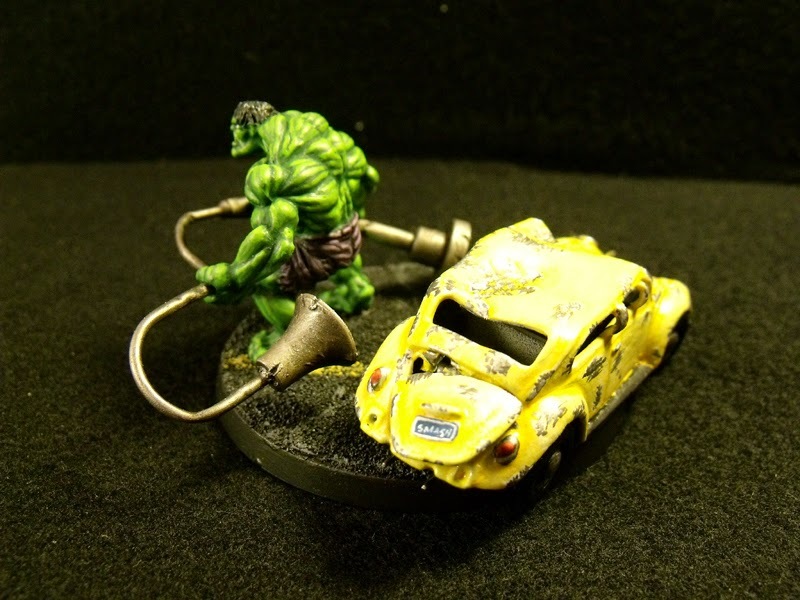 This was followed buy a few highlights and washes containing an iridescent medium added to the paint. And finally a coat of gloss clear to give it that clear coat paint look... the only problem was that the gloss doesn't like being photographed. So the color is slightly washed out in the pictures (even with the makeshift light diffusers on my lamps) Once that was all dry, I went over the dings and dents with a couple silvers to give it that weathered and beaten look. And finally I painted the license plate with the letters "SM4SH". All in all I'm really happy with the Hulk and how he turned out. Everyone I've shown him to has loved it and my cousin even suggested I try to make the other Avengers. After some research, I think I've got Iron Man and Captain America figured out... but Thor is gonna be a tough one. Hopefully I can get to work on those ones soonish.